Even infinite potential can be tempered by absolute apathy. This is an endearing tale of a boy that grows into a legend to be respected and feared. I’ll start this review off simply: If you love fantasy, don’t bother reading this review, just go read The Name of the Wind right now. Of the books that I have reviewed over the last year or so, this is quite possibly the best. It is hard to adequately convey just how good this book is. It may not be perfect, but it comes close. Kvothe is a singular talent. A man of song and heart, cunning and thievery, power of mind and magic. He is many things. Success is always at his fingertips, and yet he is broken down by horror, stretched thin by a life turned hard and he very nearly forgets all that he was. This is a story of a boy seeking to unravel the mysteries of the universe, and a man waiting to die. Being first person, it should be no surprise that Kvothe is the very foundation and substance of this novel. Kvothe carries this story on his shoulders, bearing its sometimes incredible weight, even though it breaks him in the process. For much of the novel, I tried without success to dissect Rothfuss’ story and learn what made it so compelling, however it was so well written the prose was mostly invisible. So, instead I learned about life. And that’s when you know you have something special in your hands. The book does have one weakness, one flaw that some might find issue with: plot. Largely it lacks an apparent overarching plot. There is one, but it is far in the background, moving slowly, a specter that we wish to see more of, but have to wait until the fullness of time has come about and given us the opportunity. In the mean time, the plot becomes Kvothe: his life and his trials, and lays the foundation for what I feel are great things to come. It is without doubt a journey, though one incomplete. A beginning. 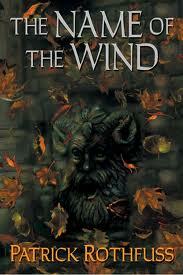 To someone who has not read The Name of the Wind, this may sound like a huge failing, and if Rothfuss had managed a stronger overarching plot, it would have made the book that much better; but it should be noted the author’s sheer skill with telling a story is such that it renders much criticism: moot. This book does not read like a debut, it reads like it is from the hands of a master, experienced in his craft. Yes, it had its irregularities, but one might argue that these are not a detriment and could very well be part of what makes it great. At times I was ready to call this book 5 stars, but as a whole I give it 4.5 incredible stars. Even though the ending does suffer, you are so thoroughly ensnared by the novel by then that you really don't care. For me, I can’t wait to read the sequel. It’s out now, so what are you waiting for? Forget about plot in this book... and you will be ready for the next. It seems almost like a collection of stories weaved together to form one massive tome. I enjoyed the book immensely and would rate it as one of my all time favorites. But, like you, I'm not quite sure why I liked it so much. Have fun plowing through the next one.